Summer is in full swing and there are plenty of trips to the pool planned along with a vacation to the beach. But I also want to celebrate the season by sharing some of the simple things I did as a child during the summer with my kiddos. Family bike ride to the ice cream shop – When I was growing up, my family lived a mile away from a quaint creamery called Adams Dairy. One of my favorite summer memories is the family biking to the dairy on warm summer nights to enjoy an ice cream cone. Catch lightning bugs – Firefly or Lightning bug? In the Kansas City suburb where I grew up, it was most definitely a lightning bug. 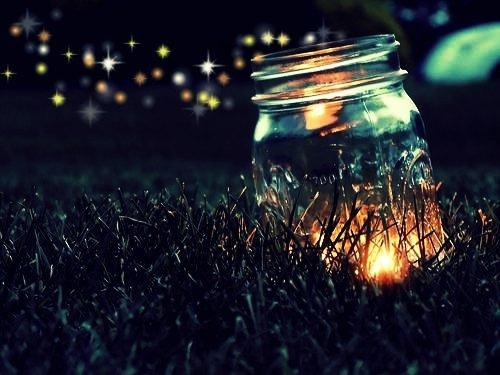 I loved catching lightning bugs in a jar with the plan to use them as a night light in my room. Somehow when I woke up each morning, the lightning bugs had “escaped” back to their natural habitat. Not sure my parents were as into my night light idea as I was. Picnic at the lake – I love Subway and Jimmy John’s as much as the next person, but there is something to be said for making your own sandwiches at home and using a real picnic basket. And there are plenty of local lakes to choose from in my beloved landlocked city. Go to the drive-in – I can remember riding to the drive-in in the back of a pickup truck loaded with pillows, blankets and friends. These days we’ll strap in with our seat belts for the drive there instead of hanging on to the edge of a truck bed, but we’ll still enjoy a movie in the summer air. Water balloon fight – We used to celebrate the last day of school by playing Red Rover (anyone remember that one?) followed by a water balloon fight. Not sure that my kids will take long drinks from the hose as they fill their balloons like I did back in the day, but they will love having a water balloon battle with friends. Pick-your-own fruit – I enjoy going to the Farmer’s Market but this summer I want my kids to experience picking their own fruit (literally). Growing up, we had an apple tree in our backyard to snag a snack from. Luckily there are several local orchards nearby where I can take the kids to pick everything from strawberries to peaches. We had a Dairy Dandy in my small town and they had the best crunch coating (basically butter brickle sprinkles) ever! I probably ate my body weight in ice cream cones ever summer. We also did the drive-in almost weekly in the summer and my dad always made a paper grocery sack full of popcorn loaded with melted butter and salt. Heaven! We caught lightning bugs too and I remember being a bit tortuous with them. We used to rub the “light” on the back of our shoes so we could play tag in the dark. They were our glow sticks, I guess. My grandparents used to have a small place at Lake Okoboji when I was growing up and I spent a lot of time with my cousins playing at the beach, on boat rides, and having a riot at Arnold’s Park. It was the best!